This blog entry is a fan-post about choosing the three best blog entires that Scott Adams, the creator of Dilbert, has posted over the month of March '12. Arguably, this is also a lazy task. Understandably, this will need some explaining. Scott Adams is a genius with hypnotic calibre. He can even prove it by producing a certain Certification in Hypnotism that hangs on his office wall, and about which we, the ardent followers of his humor blog at Dilbert.com and elsewhere such as his occasional NYT and WSJ columns, have heard more often than perhaps the issuing authorities themselves. That a certain obscure yet timely reference or reminder of being a certified hypnotist can turn his otherwise benign looking paragraphs into mesmerizing wand of a wizard is something only a certified hypnotist can do (I agree that this logic defeats itself, but I never claimed that hypnotism has anything to do with logic. If you have read Scott as regularly as he writes you have already learned that the secret of his success lies in mixing the two with a secret formula for proportions). If those holding Harvard and Oxford degrees, for instance, were to extracte the similar amount of clout value from those certificates hanging on their walls, they would be owning most of us, all of the land and seas with potential oil rigs by now. But you need to be a good hypnotist to extract value from where there is none. It is my belief that in a hypothetical scenario where Dilbert.com and Scott's other restaurant businesses were ever to get into trouble, here lies the promise of a bright alternative career for him. Of course, this is subject to him first deciding to abandon his bid for the American presidency before he actually succeeds. Even if it means American will have to wait longer for a certified hypnotist president. It is highly likely that there is a scientific term for the approach and process that Scott has mastered over the years for distribution of his verbal as well as pictorial ideas. If you are an expert in linguistics, literature or forensics, feel free to comment. As a layman -a claim that an engineer may make only in exceptional circumstances- the whole product has an experience similar to having a butterscotch pastry. Let's examine how. Humor is the cake which may sound the least important ingredient, but in fact it is the base of the structure of the pastry. The paragraphs that build the argument in cascading manner are like digging into layers of cream that confirms the flavor in a gradually increasingly reinforcing manner. Clever word play are those crunchy burned sugar nuggets confusingly called butterscotch in spite of them having no intoxicating properties. A sly spin of rejection of a popular belief is the icing and cherry on the top which is the lure for you to dig in. The overall simplicity of the package makes it suitable for many palates. And at the end of it all, depending on your own perception of your mental and physical health, if you end up having a feeling of guilt over a creamy rich diet, you can easily blame it onto being hypnotized to indulge in the first place. If you are also a regular follower of Scott's journey over the past decade this narration may sound familiar in two ways. In terms of the message as well as the bottle. The later being the style in which the message is being delivered. Internet is silent on any attempts of writing about Scott the way Scott does it. If this blog entry appears to be doing so, it is purely an accident. My limited knowledge about hypnotism suggests that it is all about doing according to the mimes of the hypnotist. Mar 29 - Gerardo and the Mob: "The public fight starts when the word "responsible" enters the conversation. Responsibility isn't a natural element of the universe. It's a useful but artificial concept, like fairness, that society uses to control its members." Mar 19 - The War on Parents: "Sometimes it feels as if our school system is at war with parents, and winning. The kids are just the ammunition." Mar 9 - The Unaware: "Imagine you're a detective, and you have to solve the case of how incompetent you are. What evidence can you find to support the assumption you have about your own incompetence?" 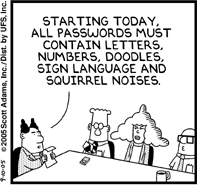 The other dozen or so totally unmissable Dilbert blog entries from March are here. Um— Scott, you spelled, "familier" wrong. Now I'm worried if you are the canadian stalker that Scott has been fending off like forever..
@anon hey Scott heard you.